This picture of the International Space Station and the moon was photographed from the space shuttle Atlantis just after the two spacecraft undocked on July 19, 2011, during NASA's final shuttle mission STS-135. You can sign up for NASA's Spot the Station alerts here: http://spotthestation.nasa.gov/. You can also find real-time satellite tracking information, including spacecraft locations over Earth at any time of day, at this website: http://www.n2yo.com/?s=25544. Photographer Jeff Berkes caught the International Space Station over West Chester, Pennsylvania, on August 13, 2011. 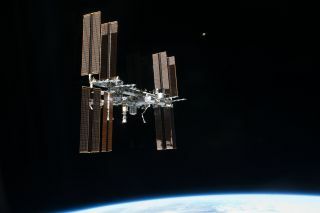 Editor's Note: If you have snapped an amazing photo of the International Space Station, or any other spacecraft or celestial object, in the night sky and would like to share the picture for a story or gallery, send images and details (including viewing location) to managing editor Tariq Malik at: tmalik@space.com.